Living a Fit and Full Life: Wendy's Adds the World's Most Consumed Fruit to Summer Salads and it's Delicious! Wendy's Adds the World's Most Consumed Fruit to Summer Salads and it's Delicious! When everyday people sort through all the ‘spin’ there is one quick-service restaurant that is ‘A Cut Above’… that’s Wendy’s … Wendy’s stands for honest food … higher quality, fresh, wholesome food … prepared when you order it … prepared by Wendy’s kind of people … people that believe this is My Wendy’s … Wendy’s does it Dave’s Way … they don’t cut corners. We start with sweet & juicy diced mango and add strawberries and honey roasted sunflower seeds. Next we add a warm grilled chicken breast and top it all off with crumbly feta cheese and honey citrus vinaigrette dressing. 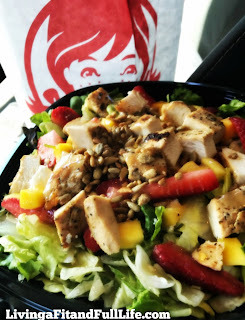 Wendy's Strawberry Mango Chicken Salad is perfect for summer! Until recently I had never even tried any sort of fruit in my salads but boy was I missing out. I honestly thought fruit in salads was incredibly weird and not something that I would like at all. The strawberries and mangos in Wendy's Strawberry Mango Chicken Salad add a sweetness that pairs perfectly with the savory grilled chicken and delicious honey citrus vinaigrette dressing. I also love the honey roasted sunflower seeds and crumbly feta cheese. The flavors meld together wonderfully and I'm already craving another one of Wendy's Strawberry Mango Chicken Salads! Click HERE to find a Wendy’s near you! Click HERE to learn more about Wendy’s! 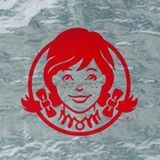 Follow Wendy’s on social media!